View the entire table of contents for the Oct. 15, 2000 issue. October 15th, 2000 French Barrelmaker Turns to Russian Oak Many winemakers favor French oak when it comes to choosing the barrels in which to ferment or age their wines. But because quality oak is in short supply and is so expensive, Cognac-based barrelmaker Seguin Moreau is looking beyond its traditional sources in the forests of France and rediscovering Russian oak, a favorite of high-end Bordeaux estates before the Soviet era. 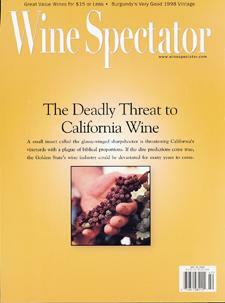 For the full article, check out the new issue of Wine Spectator, on newsstands October 15, 2000.